The May Bundle is a beautiful collection with happy and bright colors for making all your happy memories! Wonderful bits and pieces again, beautiful teared masks and magic lights,(I love the contrasts of the colors with the black),and some awesome Wordarts,are making this collection a very beautiful one once again! 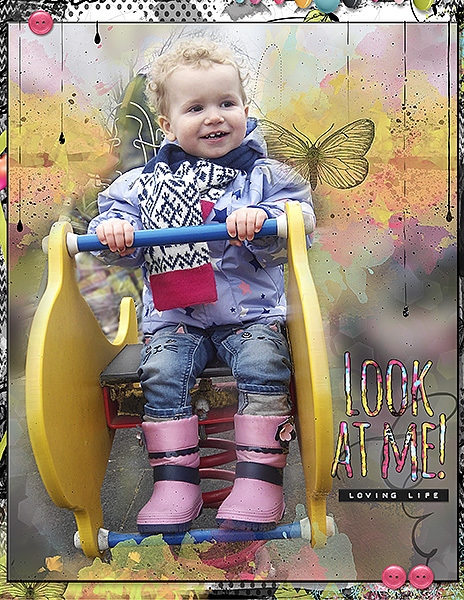 I made this page of my granddaughter outside at the playground.The background of the photo was not as nice as her look in the foreground! So I made her a colorful artsy background!